Wow doesn’t it look so much different?? (Sarcasm does not translate well over the Internet) Well, life got in the way of transforming our master bath and this is the best we could do right now. We got the mirror over Labor Day weekend at Lowe’s for 12.00! 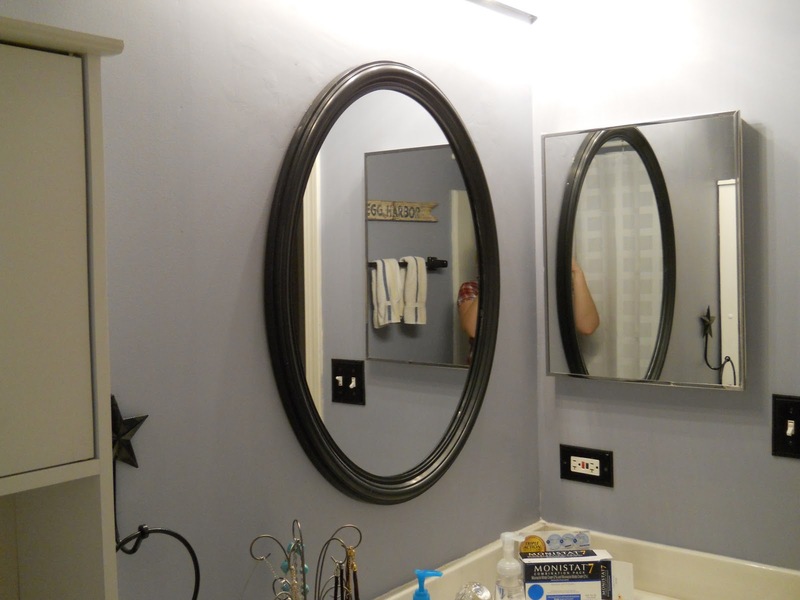 The cute little towel holder was $1.99 at Goodwill and Mike spray painted our formally white, circa 1987 fixtures a black color to meld with the mirror. He also sanded and painted the wall where the old mirror was with paint left behind by the previous owners. We called Home Depot and they assured us that the paint was fine. I don’t think it’s fine. I think it is the reason behind me gaining two pounds since it went in the bathroom. Bad paint. Go here to see if they still have some great mirrors left!